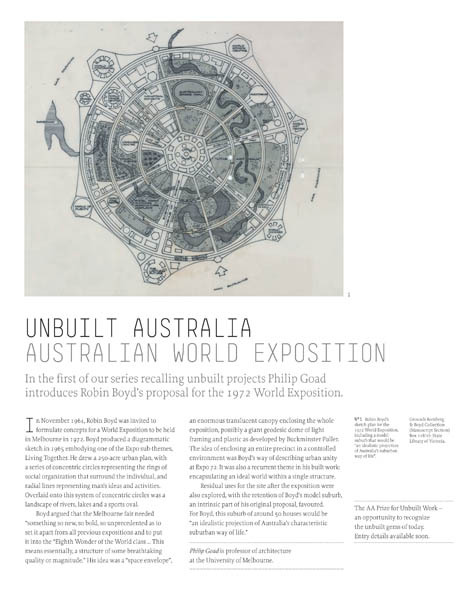 [Image: The unbuilt Australian World Exposition (1972); read the PDF for more]. Having just returned from Melbourne, and preparing to go back to Sydney in July, I've got Australia on the brain. 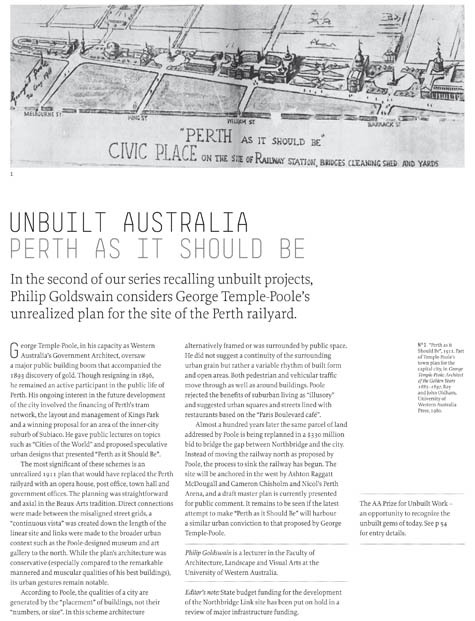 Amongst the huge variety of things I've come across in the last few days while researching Australian architecture is the AA Prize for Unbuilt Work – particularly the historical series "Unbuilt Australia," published by Architecture Australia. [Image: "Perth as it Should Be" (PDF)]. 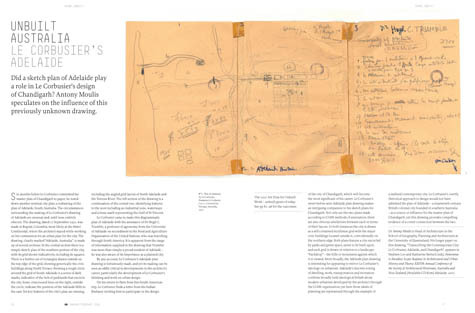 There are some great stories here, ranging from early plans for "Perth as it Should Be" (check out the PDF) to an under-known, September 1950 sketch by Le Corbusier for the redesign of Adelaide (worth viewing the PDF in full). Did Corbu's speculative plans Down Under reveal ideas that he would later go on to build in Chandigarh? 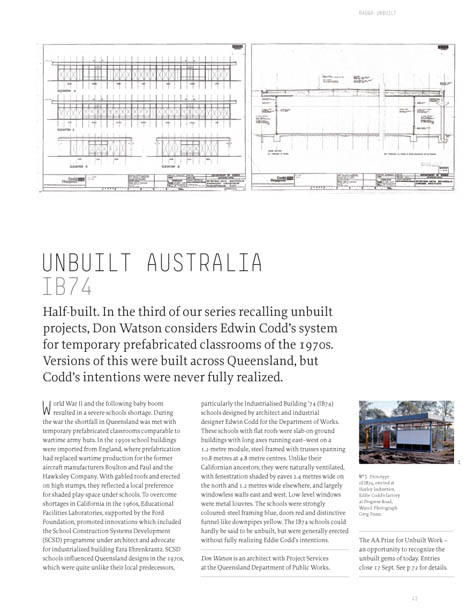 One of my favorite unbuilt projects from the series is one that was, in fact, partially implemented: Edwin Codd's Industrialised Building ’74 project, a prefabricated, modular classroom intended for deployment throughout rural Queensland. "These schools with flat roofs were slab-on-ground buildings with long axes running east–west on a 1.2-metre module, steel-framed with trusses spanning 10.8 metres at 4.8-metre centres," Don Watson writes in a brief article (read the PDF). Each structure was "naturally ventilated," he continues, as well as "strongly coloured: steel framing blue, doors red and distinctive funnel-like downpipes yellow." In fact, I've been running into more and more plans lately for modular, prefab, easily-deployable instant classrooms – so perhaps a future post is in order, exploring some of those more interesting ideas. [Image: Edwin Codd's prefabricated Queensland classrooms (PDF)]. Other projects from the series include a "Venetian 'City of Hope'" (PDF), a new Australian Parliament House (PDF), a look at something called Hackney Modern (PDF), and the "Dream City of Mackay" (PDF), Karl Langer's excessively rational plan for a sub-tropical garden city. 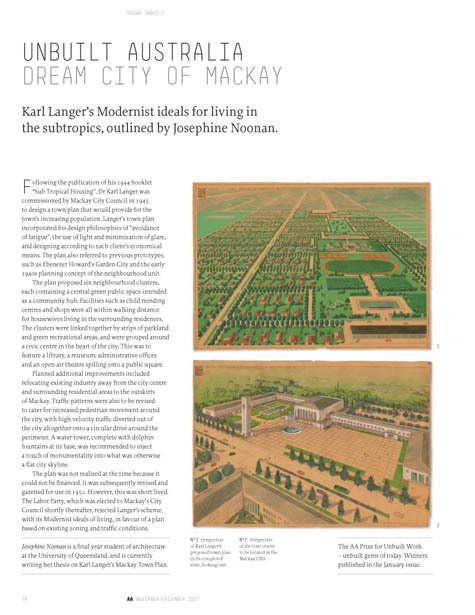 [Image: Karl Langer's "dream city" of Mackay (PDF)]. It's a brilliant series, and it would be extremely interesting to see this reproduced elsewhere – from a regular look at "Unbuilt London" to a series of articles about unrealized Colonial-era plans for U.S. cities. "Unbuilt Philadelphia," "Unbuilt Savannah," "Unbuilt Washington D.C."
Check out the rest of the series at Architecture Australia (scroll down). Along these lines, Unbuilt Melbourne was an audio tour organised as part of the Melbourne International Design Festival last year. The tour involved borrowing an ipod with commentaries on 13 different unbuilt projects located around Melbourne, and a map locating each project. Projects included Steven Holls proposal for bridge buildings over the Yarrah River and the never built 'shard' of Fed Square. I went to primary school in Queensland in buildings based around Edwin Codd's IB74 project, and they were hideous classrooms. Ugly, boring and hot as hell in summer. The only interesting part of the buildings were the oversize down pipes. They are still being used at my old school today, probably long overdue being demolished. Pinball, that's sad to hear - but I don't lose hope or interest in the basic idea; let's hope better educational prefab is here to stay. Is there a "Demolished Australia" contest for well-chosen, well-planned and well-executed demolition? Just as the best interior design depends upon vigorous disposal, the best landscape- and urban design depends upon vigorous demolition. Unbuilt America came out from MIT Press back in the mid 70s, and it was full of neat projects that never quite made it. I loved the 19th century proposal for the Aggrandizement of Washington [DC] complete with a replica of the Temple in Jerusalem and the hanging gardens of Babylon. Hall vs Cram on the Columbus cathedral was a true test of faith, especially considering the demand for an underground parking garage. Try Bookfinder for an old copy.